It has become the behemoth of British television, a sprawling jungle of coverage in which the biggest beasts of broadcasting roam uttering strange war whoops and clashing with predators beamed from all around the kingdom. Unrivalled as both news event and fantasy playground for computer whizzkids, Election night is now firmly fixed as a great television moment. BBC Television has been covering election nights for 50 years. Before that men in dinner jackets sat stiffly before microphones telling a grateful nation whom their next government would be. It didn't change that radically with the introduction of BBC TV. As was to be so often the case, it needed competition in the form of ITN to spur the BBC to raise its game. The first of the Dimblebys, Richard, was brought in to anchor what became a 17-hour programme. In 1979, after a brief break with tradition, the hereditary principle was restored in the form of his son David. Clearly having a Dimbleby was becoming a pre-requisite of a televised election. In 1997 ITN bowed to the inevitable and scooped up the other Dimbleby, Jonathan. Now their stranglehold on broadcasting was complete. It's not just the anchormen who have evolved: prediction of the result has become a high art form. The BBC commissioned the first exit poll, and since then has regularly ended up with egg all over its face as it has predicted the wrong result. The howls of anguish from senior management can be heard around Television Centre: even the phrase "exit poll" has at times been banished from the programme. Maybe that's being unfair, a little too harsh. The operation is enormous: around 80 outside broadcasts beam pictures into eight regional hubs, who then offer breaking stories to the central hub in Television Centre. At the same time, a 700-strong results team is feeding tips stories and results from every constituency into the central machine, which itself sends the finished product to a mammoth graphics operation. The graphics now receive equal amounts of affection and derision from the audience. 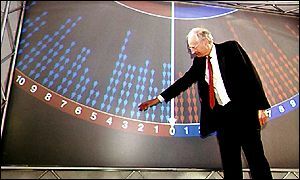 Peter Snow fronts the operation: he pays tribute to the "fantastic team" of graphic artists at the BBC and insists that despite his own much imitated high energy routine, it's not an elevated game show. "It's not an entertainment show, it's a show that explains how the vote is unravelling, how and why people are voting and what it's going to mean - it's a major national occasion. "But ok, if we can have a bit of a laugh and entertain people a bit at the same time, all the better." The big change over the years of televising the event has been the attitude and activity of the politicians to the presence of cameras. Harold Wilson was arguably the first British Prime Minister who really understood television and the power of the image. Asked how he felt on his first victorious election night, he told the country that he felt like a drink. Margaret Thatcher recited St Francis of Assisi on the steps of her new Prime Ministerial residence. But Tony Blair took the entrance to Downing Street to new heights - he was greeted by hundreds of cheering well-wishers waving Union Jacks. Where did they come from? David Dimbleby has little doubt: it was a set up by the Labour party, which was why he insisted on playing the commentary cool against the near hysteria of the crowd in Downing Street. "That was a contrivance," says Dimbleby. He was ticked off in the early Seventies when he described US President Richard Nixon's visit to Britain in the same terms - but he is adamant that you need to point up how live pictures are manipulated. "You have to point out that what the viewer sees is not necessarily the whole truth."